The talks held in Singapore on 12 June between the leader of the socialist Democratic People’s Republic of Korea (DPRK), Comrade Kim Jong Un, and the President of the United States of America, (USA) Donald J Trump, constitute an historic victory for the Korean people in their long struggle against US imperialism for national reunification and the building of socialism. 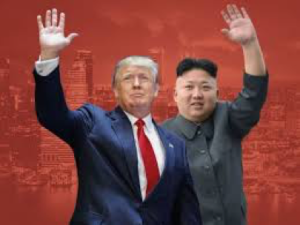 However, given that the DPRK’s door has always been open for a respectful dialogue between equals, it must be said that Mr Trump deserves a degree of credit for having the courage to do what none of his predecessors had the guts or integrity to do whilst in office – to accept an outstretched hand and to agree to sit as equals on neutral ground with his DPRK counterpart and discuss matters of common concern in a manner that befits the leaders of two sovereign nations. “3. Reaffirming the 27 April 2018 Panmunjom Declaration [signed between Kim Jong Un and south Korean president Mun Jae In – Ed. ], the DPRK commits to work toward complete denuclearisation of the Korean peninsula. • Complete denuclearisation of the Korean peninsula has been the consistent policy of the DPRK. Indeed, following the country’s first nuclear test, it was referred to as the final instruction of President Kim Il Sung, the DPRK’s revered founding father. As it was the United States that first introduced nuclear weapons to Korea and has consistently used them to threaten the north, complete denuclearisation of the peninsula can by no means be reduced simply to a unilateral step by the DPRK. • The US had all along been insisting that the DPRK take immediate steps to disarm and that such nuclear disarmament be “complete, verifiable and irreversible” (CVID). Such language, however, is completely missing from the joint statement. Moreover, whilst President Trump and members of his team continue publicly to insist that the sanctions regime and other forms of pressure will remain in place until denuclearisation occurs, the statement’s recognition that “mutual confidence building can promote the denuclearisation of the Korean peninsula”, lends credence to the DPRK’s subsequent assertion that the progressive lifting of sanctions would form an integral part of the peace process. Clearly, the whole tenor of the joint statement indicates that it is the US side that made significant concessions to the DPRK rather than the other way round, something that Trump’s churlish domestic critics, foremost among them those sanctimonious liberals who but yesterday were excoriating him for supposedly being a warmonger, have been quick to point out, in an attempt to undo the summit’s achievements. However, every opinion poll indicates that a clear majority of the American people support Trump’s rapprochement with the DPRK. Then, hot on the heels of the Singapore summit, Kim Jong Un paid his third visit to China in 100 days from 19-20 June, and is expected to meet with President Putin within this year. The imperialist lie, so assiduously promoted by the opportunist left as well, that the DPRK is an isolated country without friends has lost any vestige of credibility. At a banquet in honour of his Korean guest, “Xi Jinping warmly welcomed Kim Jong Un’s China visit, saying that this fully showed his fixed will to attach great importance to the strengthened strategic communication between the two parties of China and the DPRK and develop the traditional friendship of the two countries and demonstrated to the whole world the invincibility of the relations between the two parties and two countries. “After Chairman Kim Jong Un’s China visit in March, the China-DPRK relations have entered a new phase of development and the important joint agreements of both sides are being implemented one by one and the China-DPRK relations of friendship and cooperation are in new vigour, Xi Jinping stated. “Noting that Kim Jong Un has made great efforts to protect peace and stability of the Korean peninsula by leading the Korean people and further consolidated the trend of dialogue and détente on the peninsula, Xi Jinping said he is pleased to see it and highly appreciates it. “He affirmed that China and the DPRK would learn, consult, unite and cooperate with each other as close friends and comrades to jointly open up rosier and beautiful future of the socialist cause in the two countries. “Saying the picture of the DPRK and China sharing joy and sorrow and sincerely helping and cooperating with each other like family members clearly demonstrates at home and abroad that the relations between the two parties and two countries are developing into the unprecedentedly special relationship beyond the traditional ties, Kim Jong Un stated that he would make every possible effort to steadily develop the DPRK-China friendly relations onto a new high level, valuing affinity and affection forged with Xi Jinping.